Caption slip reads: "Photographer: Richardson. Date: 1951-09-03. Reporter: Swaim. Assignment: Labor picnic, Pasadena. 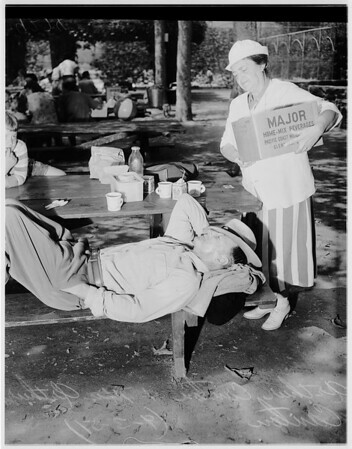 K11: Arthur Canton, carpenter, takes it easy on Labor Day while wife, Anna, labors over picnic table. K12: Horace Eichorn, 79, retired Iowa farmer, and Charles Cooke, 77, retired carpenter, discuss politics at AFL Labor Day picnic, Pasadena. K8: Charles Cooke, 77, retired carpenter, and Steven Duran, 2, watch enthralled during outdoor entertainment at AFL Labor picnic. K7: Wilbur Kane, jeweler, with wife, Jeanette, daughter Robbie, 2 1/2, and son Howie, 20 moths, arriving at picnic".